in the oval bowls of spoons? flicker down on the cut grass? waxy, soapy perfume of spring. shine so? Tell me if you know. Some of you may know that I finally hopped on the FlyLady bandwagon this month. 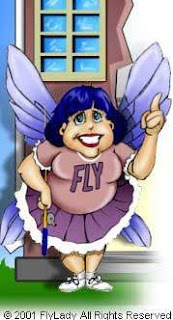 I first heard of FlyLady a few years ago when one of my cousins posted a message to our family email list extolling the virtues of the woman who sent out emails everyday telling you to put shoes on and do your housework. I resisted it for a long time, because I thought that I was doing fine with my housework, and I didn't need anybody telling me I needed to wear shoes (which I find horribly uncomfortable at the best of times). Well, I was feeling a bit overwhelmed a few weeks ago. It had been far too long since I had been able to convince myself to clean the bathroom, and the laundry and dishes never seemed to get finished either (not to mention vacuuming, heaven forbid). I felt like I was barely keeping up with things with just Peter and Myself contributing to the mess. How was I going to do it all with the baby coming, too? I thought that if I told myself I didn't have a choice about what to do, I might have less trouble getting started, so I went to look at the FlyLady site. I was pretty intimidated by the idea of setting up morning and evening routines, keeping my kitchen sink free of dishes AT ALL TIMES, and cleaning the bathroom EVERY DAY. I was already tired and out of time, how could I fit those routines and demands in too? I wanted to give it a try though, so I signed up for the emails, and convinced my sister-in-law to try it with me so I'd have encouragement. I began the 30 days of baby steps to get into the full swing of things in her system...and discovered a miracle! Without realizing it, I already had a morning and evening routine -- and they were full of things that wasted time, and contributed to my general blah feeling. It doesn't take much more time to put on real clothes than it does to throw on a housedress, but I feel so much better about myself when I have a real outfit and jewelry on (I still don't wear shoes, but what works for her doesn't necessarily have to work for me). It takes about ten extra seconds to put my dishes directly into the dishwasher, and less than one commercial break to wash the pots from dinner -- but there's never a giant pile of dishes getting moldy in the sink. I only check blogs about once a week now -- not many people I read post more often than once or twice a week anyway -- and I cut out one especially time wasting and not especially valuable site entirely. Each day there's a cleaning mission that takes about 15 minutes, and once a week, there's a marathon 1 hour "home blessing" when the vacuuming and other non-daily tasks get done. The miracle is that instead of feeling oppressed by the system and my housework, I feel entirely freed from it. The whole house stays clean in a ridiculously short amount of time (you'd be amazed at what you can get done in 15 minutes when you're racing the timer), and the rest of the day I'm free to do anything else that strikes my fancy. I've been reading, doing projects, getting yardwork done, and feeling great! My therapist asked me this week whether I'd been having distracting obsessive thoughts, and I realized that I hadn't. Without piles of work sitting around guilting at me, my mind is much more clear. I've even been able to turn off the radio and TV that I keep on almost all the time to keep me from thinking too much. I know that there will be more to do when baby arrives, but I feel much better able to deal with it, and I think that's a miracle everyone should hear about. I even compare it to the gospel -- people think that living by all those commandments is so hard until they try it and find that it really makes life easier. Congratulations on being a Flybaby. I did that some time ago and found it really helpful. More power to you! Congratulations on finding something that works so well for you, Karen! I'm happy to hear about it, and I agree with you about the non-necessity of shoes. children who drop food and small toys on the floor. Told ya so! :) She and her program changed my life. Wow. So proud of you. The bricks and rocks look great. And the flowers look wonderful! I had noticed the calla lilies in neighbors' yards there in the park and thought they were wonderful. How cool that you have some of your own. And I love the nasturtiums too. Wow, that's great! I've been trying to figure out what I really want to get done, so I can tell if I've accomplished anything.